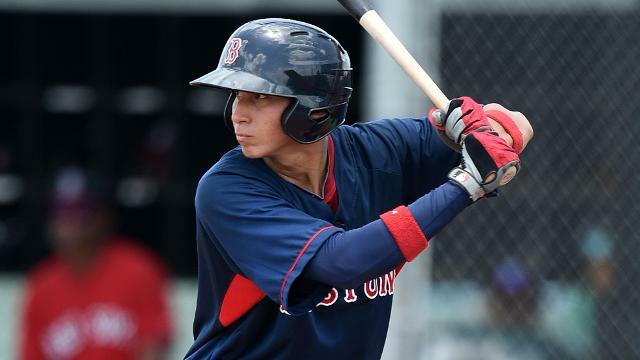 The Gulf Coast League is filled with young prospects who are just beginning to feel their way around not only pro ball in general but specifically their first Major League farm system's. Well, there's no way to get acclimated quite like facing your organization's fiercest rival in a best-of-3 championship, as the GCL Red Sox and Yankees 1 teams learned Saturday. Led by Javier Guerra and Rafael Devers, the Sox jumped out to a 1-0 lead in the series Saturday with a 6-2 win over the Yankees. The pair broke open the scoring in the first inning when a Guerra double was followed up by a Devers' home run to left field off Yankees starter and 2014 third-rounder Austin DeCarr. Guerra would add an RBI single the following inning and a run-scoring double as part of a three-run sixth. The 18-year-old shortstop, who batted .258 with a .672 OPS during the season, finished 4-for-5 with the two doubles, two RBIs and a run scored from the No. 2 spot in the lineup. It is his first four-hit performance since July 31, 2013 in the Dominican Summer League and makes him 7-for-11 (.636) during the GCL playoffs. Devers' homer was just the latest part in what has been an impressive first season in the Sox system. Playing at DH on Saturday, the 17-year-old slugger collected his eighth homer of the season and first of the playoffs. The Dominican Republic native signed for $1.5 million last summer and then forced his way stateside this season after putting up a .337/.445/.538 line in 28 games in the DSL. He proved to be just as impressive in the GCL, where his slash line was .312/.374/.484 in 42 contests despite his youth. As such, he climbed to No. 6 in MLB.com's latest ranking of Red Sox prospects this season. Left-hander Dedgar Jimenez (1-0) got the win after allowing one unearned run on two hits and a walk over five innings Saturday. Right-hander Jose Almonte earned the save by giving up only one run on five hits and two walks over the final four frames. DeCarr (0-1) exited after only two innings, having surrendered three runs (two earned) on three hits and two walks while striking out four. Second baseman Bryan Cuevas went 2-for-4 with an RBI from the leadoff spot for the Yankees 1 team, which beat the GCL Yankees 2 squad Friday to earn its spot in the finals.